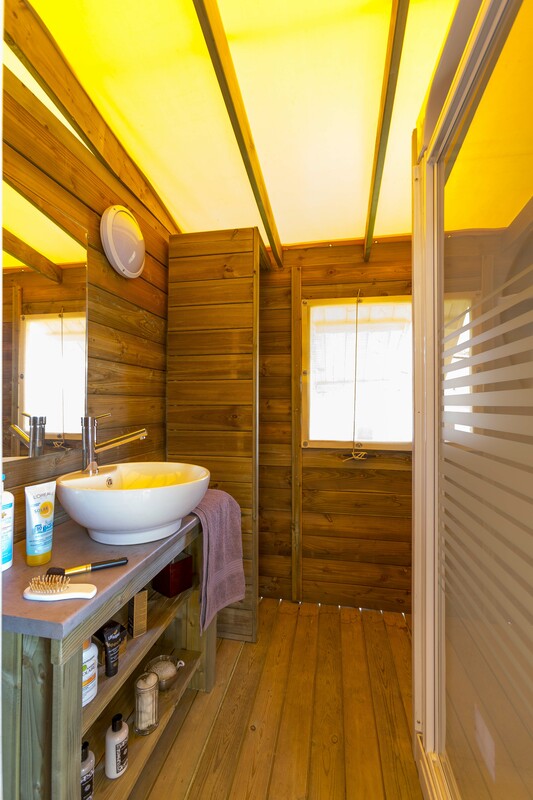 We offer 15 mobile-homes, lodges and chalets with sanitary facilities and fully equipped for rent. 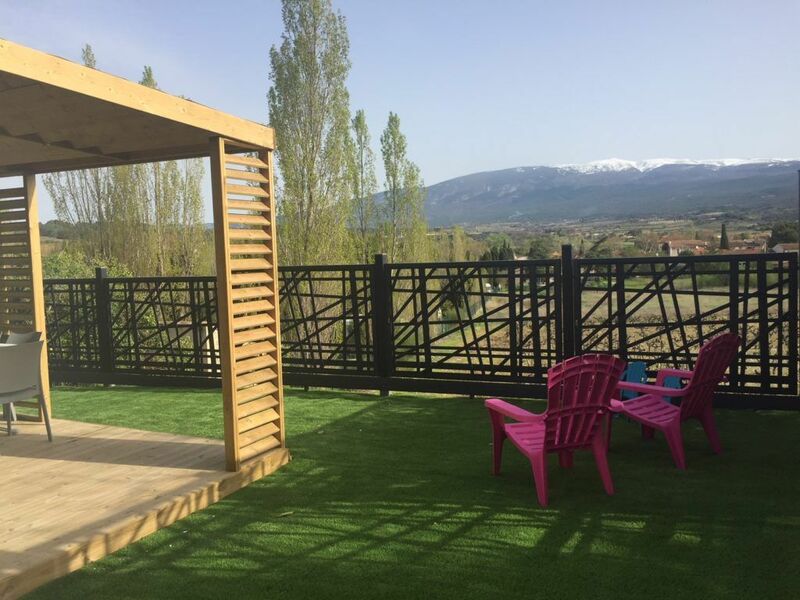 They have a view out to the Mont Ventoux or vineyards. 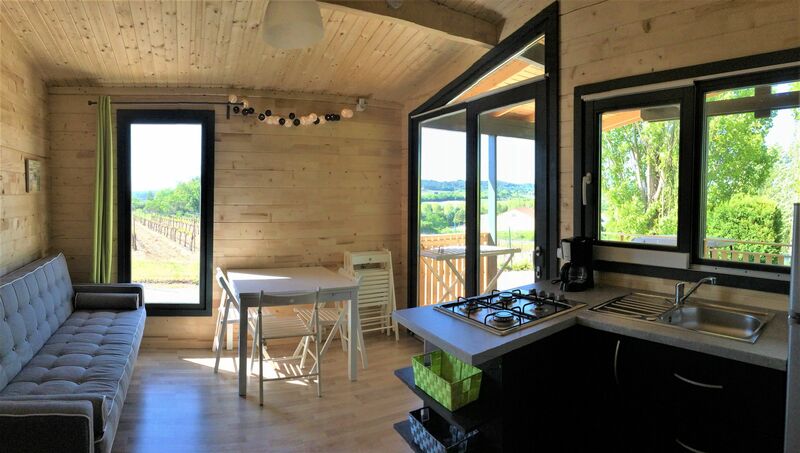 We also offer 2 new insolite accommodation : the Pods. 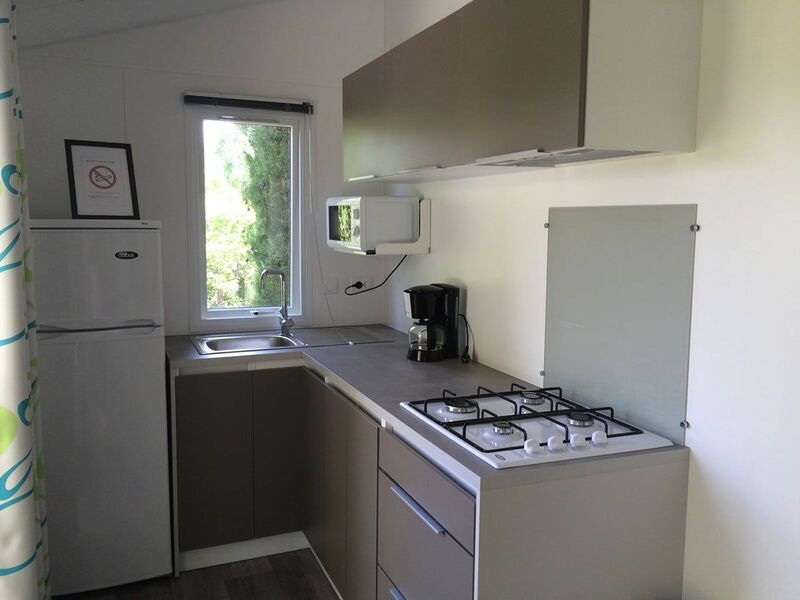 Mobile Home Trigano - 18 sq.m. Lodge Sahari - 21 sq.m. Mobile Home Roller - 22 sq.m. 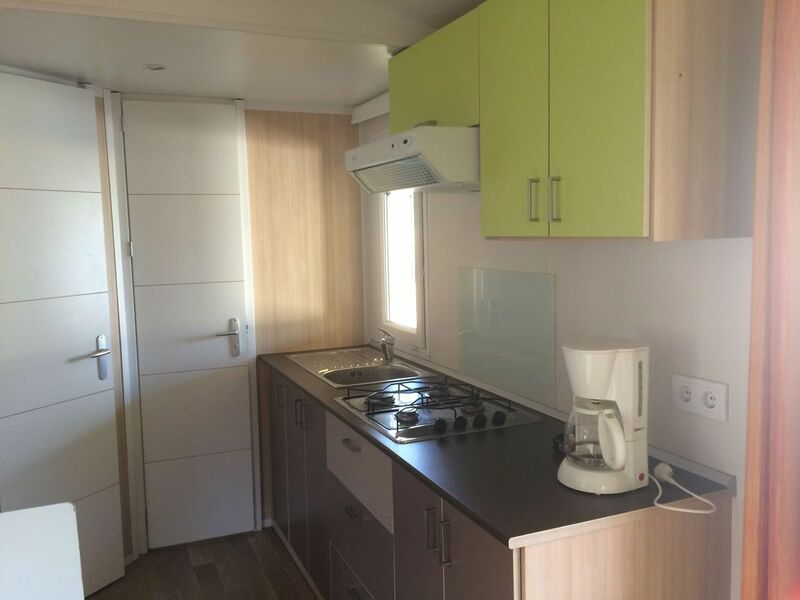 Mobile Home Malaga - 23 sq.m. 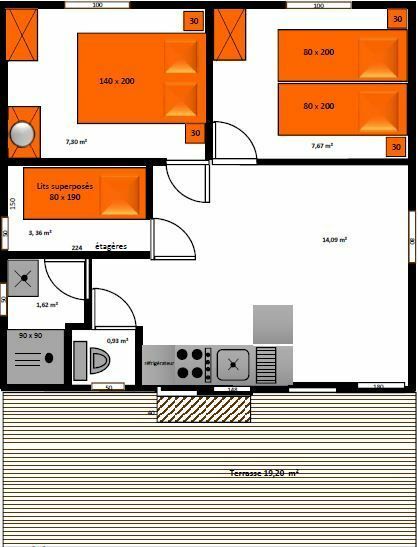 Mobile Home Bahia - 32 sq.m. 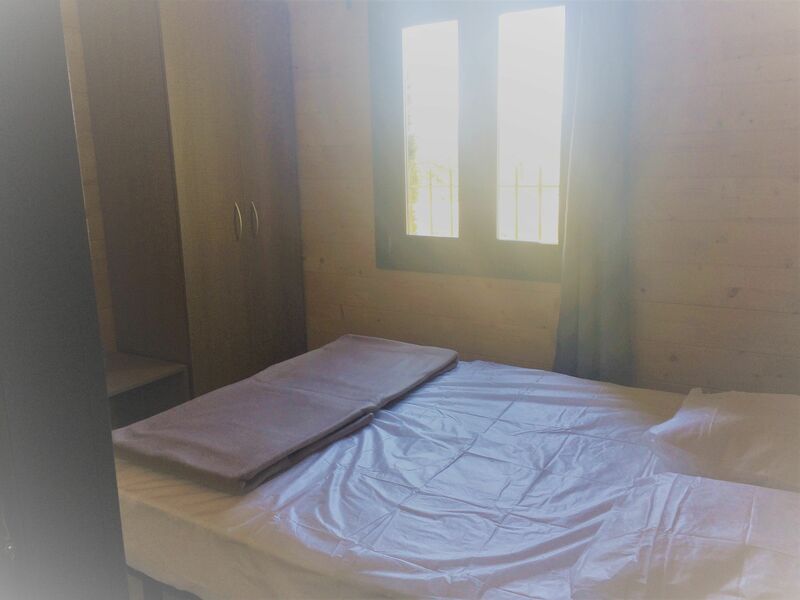 Chalet Sesame - 31 sq.m. 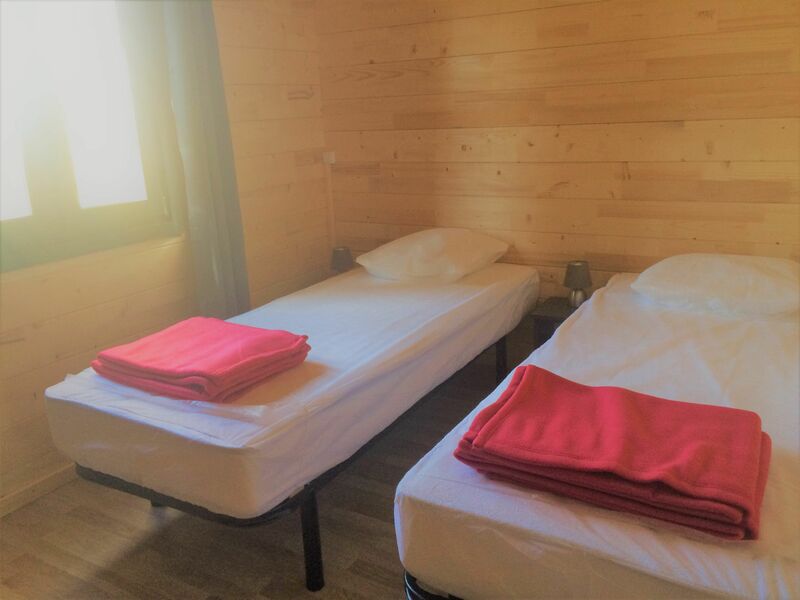 Chalet Transylvanie - 35 sq.m. 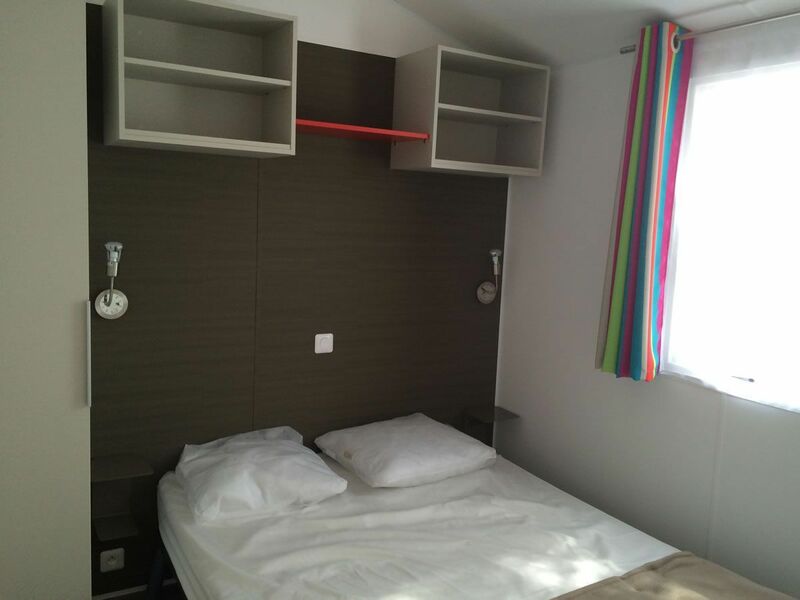 One bedroom with 140 cm bed with bedding. 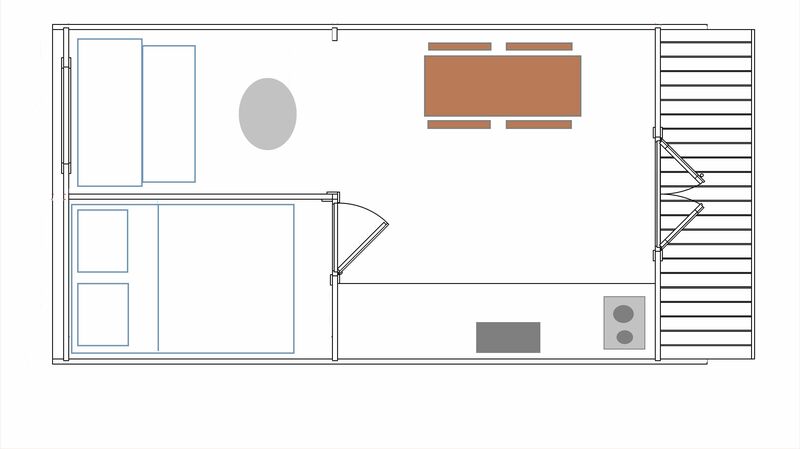 A living room with convertible sofa bed with bedding for 2 people. 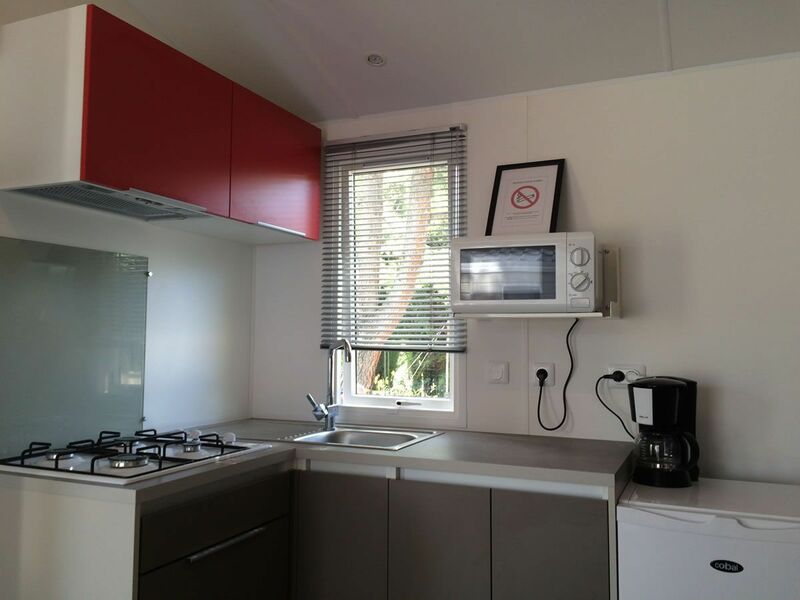 A lounge area and kitchen with electric hob, refrigerator, coffee maker, microwave, dishes and cutlery. 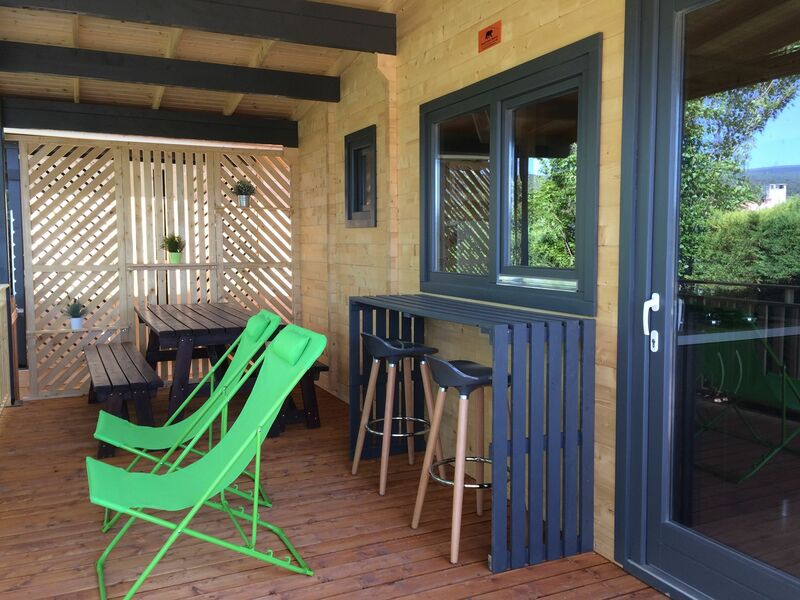 A patio of 10 m ² including a lounge area. A parking space for one car is included in the price. 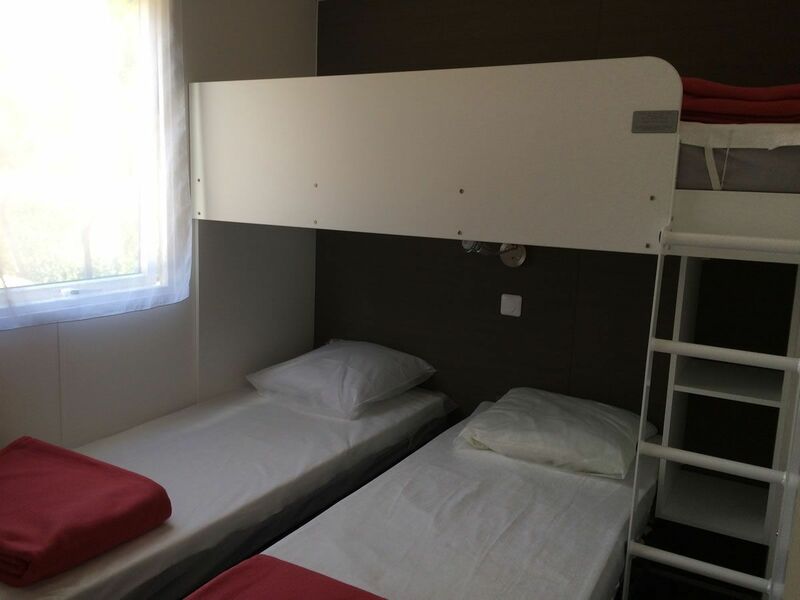 Showers and toilets, sinks and water supply are all nearby, as the pods don’t have bathroom facilities. 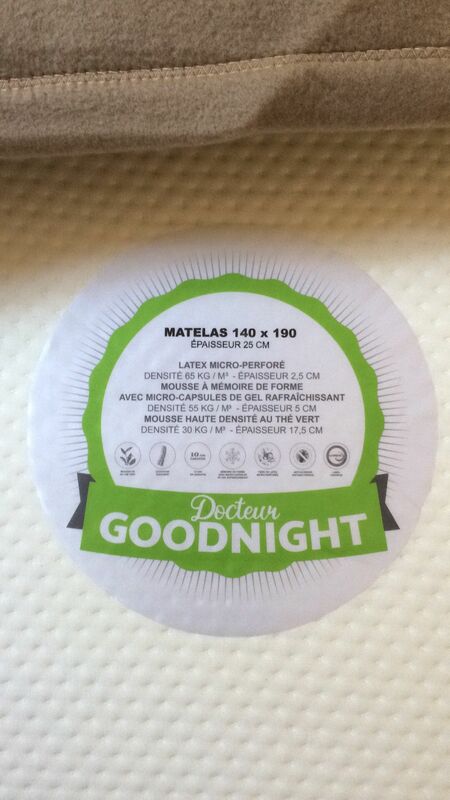 You can check the inventory of Pod Insolite here. NEW 2019! 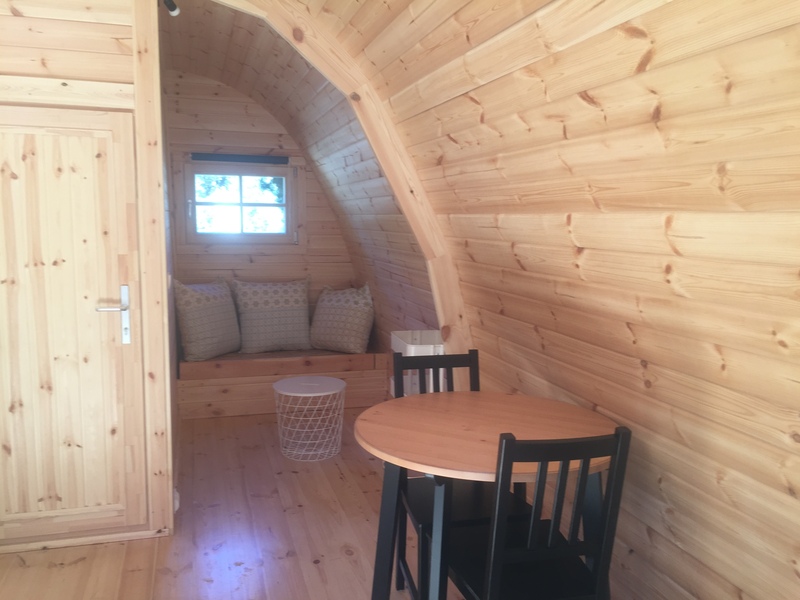 This unusual pod allows you to enjoy camping with the comfort of being surrounded by natural wood. A bedroom with bed of 140 cm with blanket (new mattress 2017). A living room/dining room with bench and table. 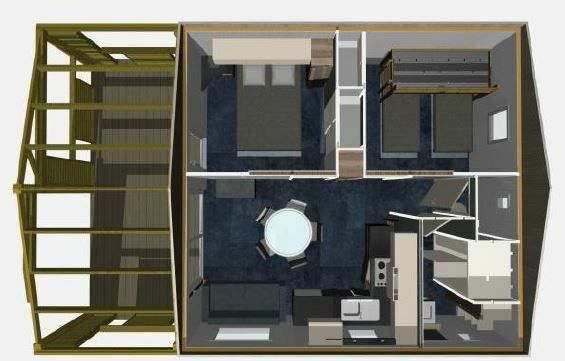 A bathroom with wahsbasin, shower and separated toilet. A covered terrace of 15 sq.m. 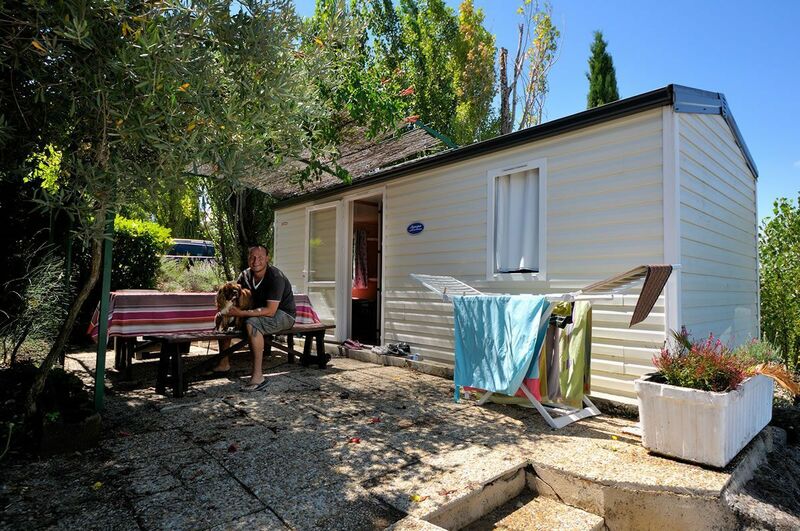 in front of the mobile home with a garden furniture and 2 sun baths. A parking space for 1 car is included in the price. You can consult the inventory of mobilhome Trigano here. 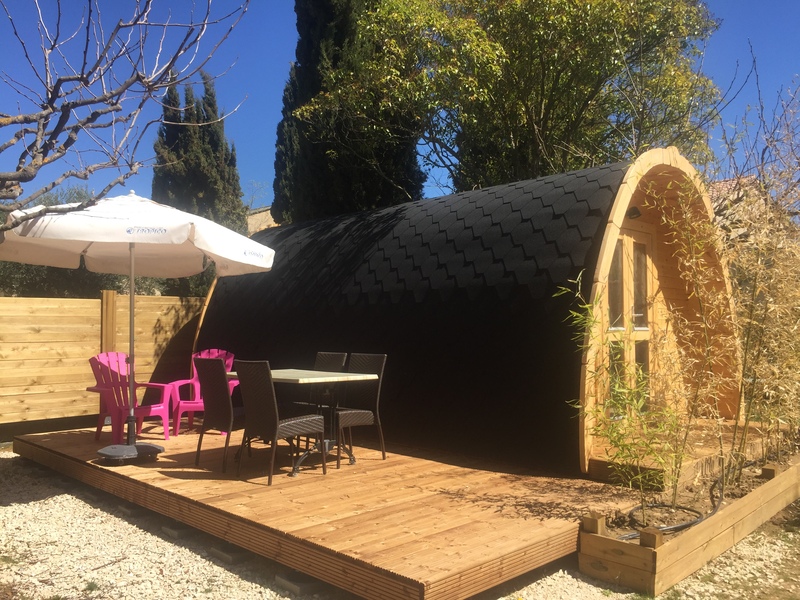 Ideal for a romantic stay, you will love the large terrace with a great view on Mont Ventoux! 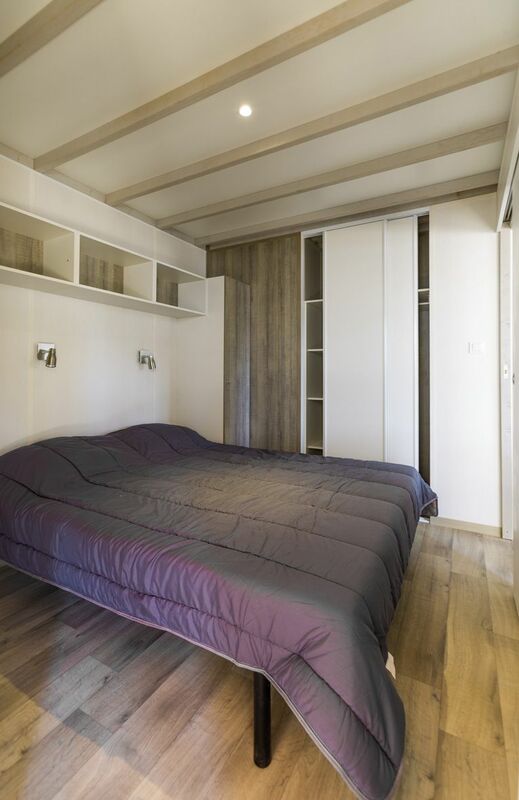 A bedroom with of bed of 140 cm with a blanket. 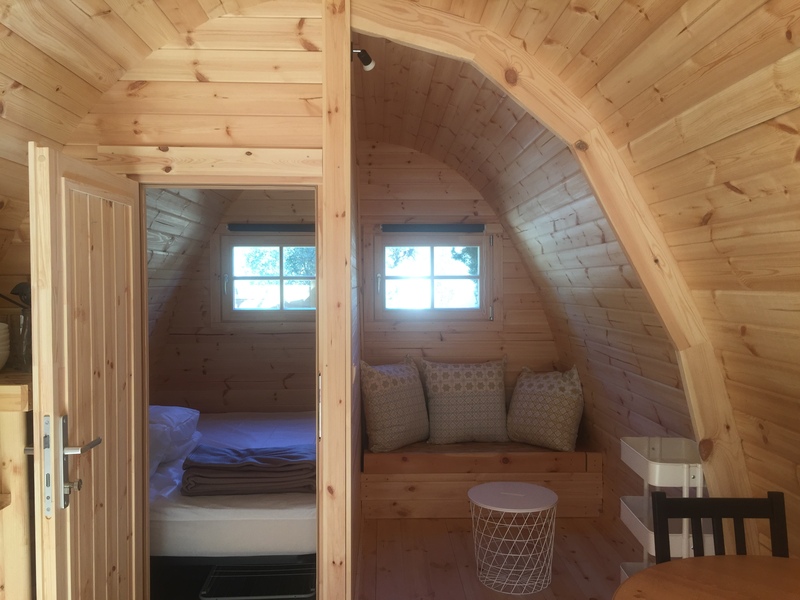 A bedroom with 3 beds of 80 cm of large, including 1 mezzanine bed (kid more than 6 years old), with blankets. A covered terrace of 10.50 sq.m. with garden furniture. You can consult the inventory of lodge Sahari here. NEW 2018! 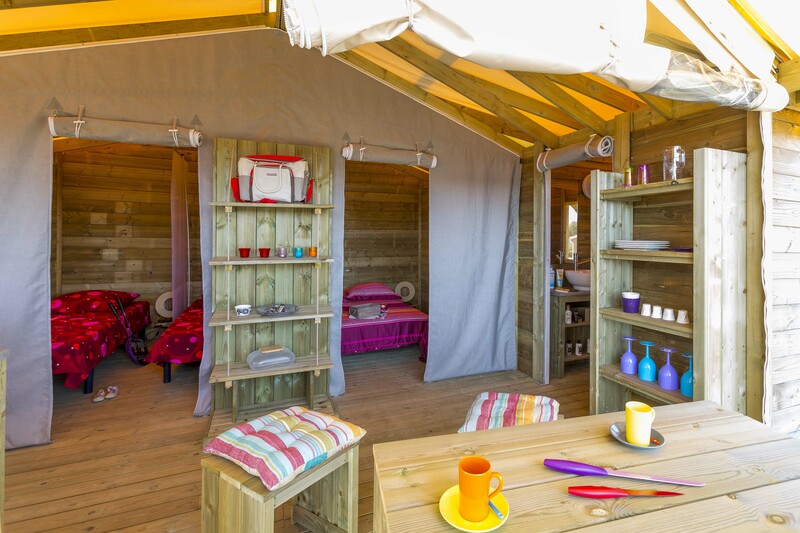 Enjoy the comfort of a mobile home in the natural spirit of camping. A bedroom with bed of 140 cm (new mattress 2017). 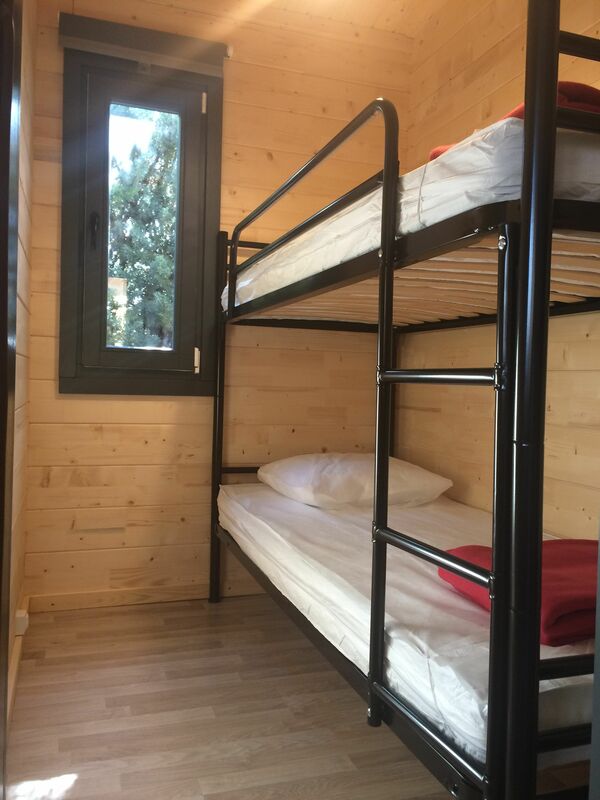 A bedroom with two twin beds of 70 cm. A living room/dining room – kitchen. 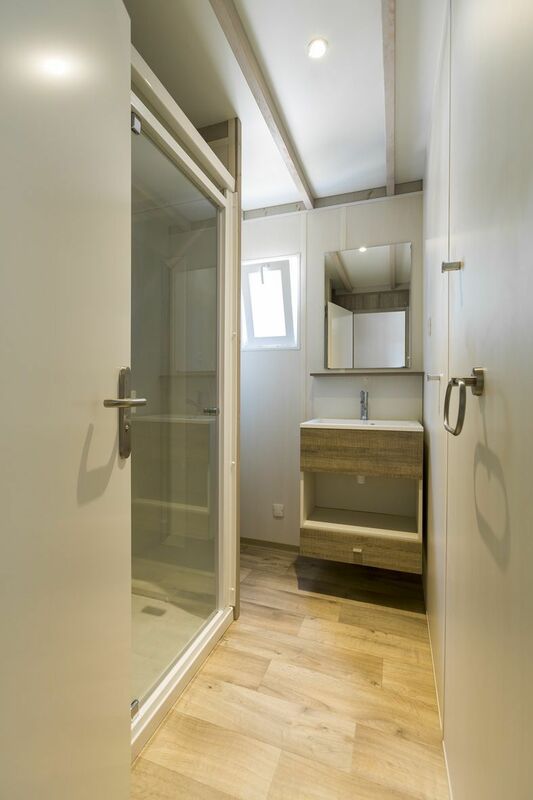 A water room with shower. A separated WC of the water room. A covered terrace of 20 sq.m. 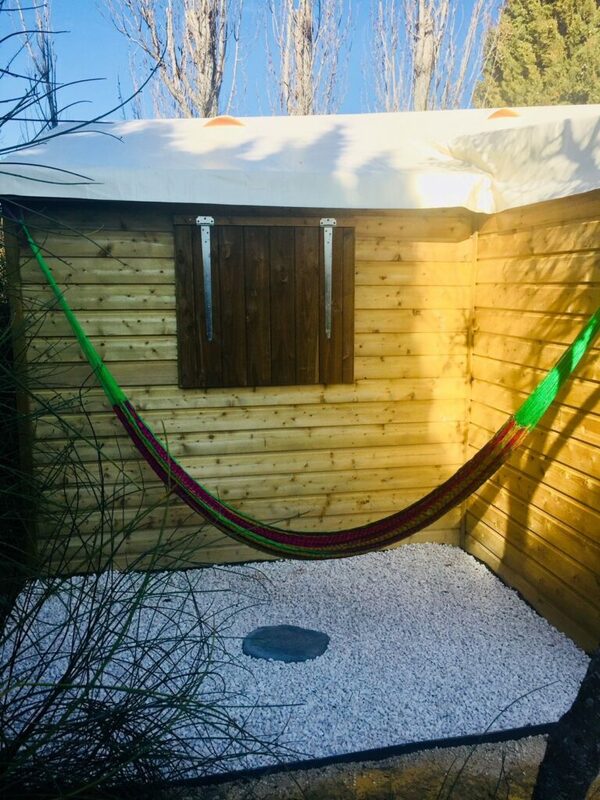 in front of the mobile home with garden furniture and 2 sun baths. A blanket or duvet for each bed, pillows. You can consult the inventory of mobilhome Roller here. 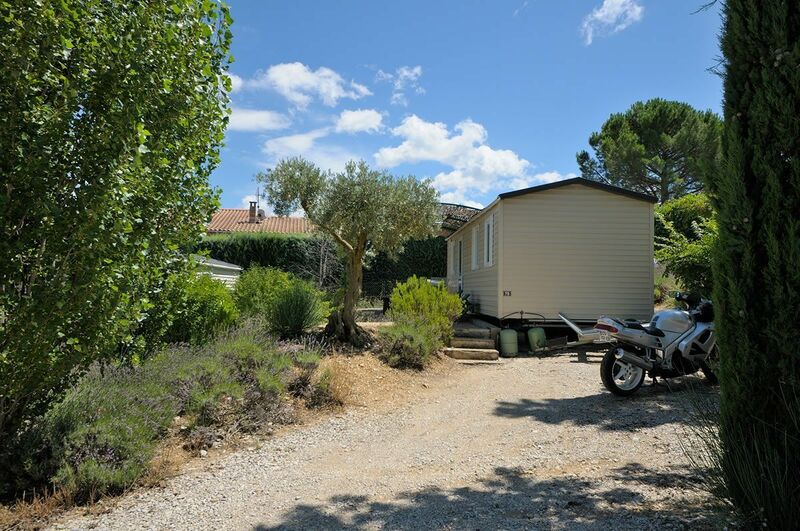 Enjoy the large terrace in the quietness and the view on Mont Ventoux or vineyards! A bedroom with bed 140 cm with blanket. 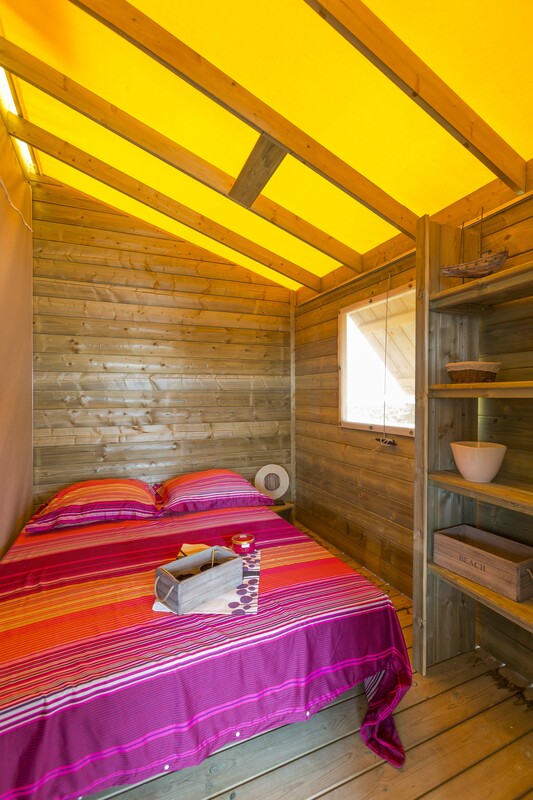 A bedroom with 3 beds 80 cm (including one mezzanine bed for children over 6 years old), with blankets. A living / dining room. 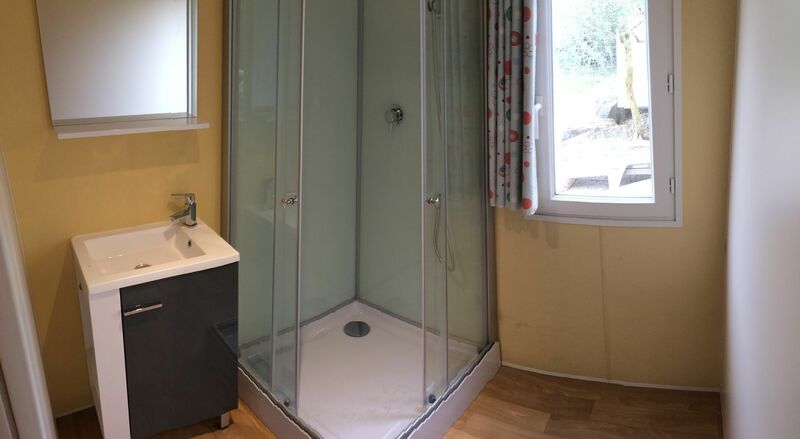 A bathroom with shower and separated toilet. A covered terrace of 8 sq.m. with garden furniture. You can consult the inventory of mobilhome Malaga here. 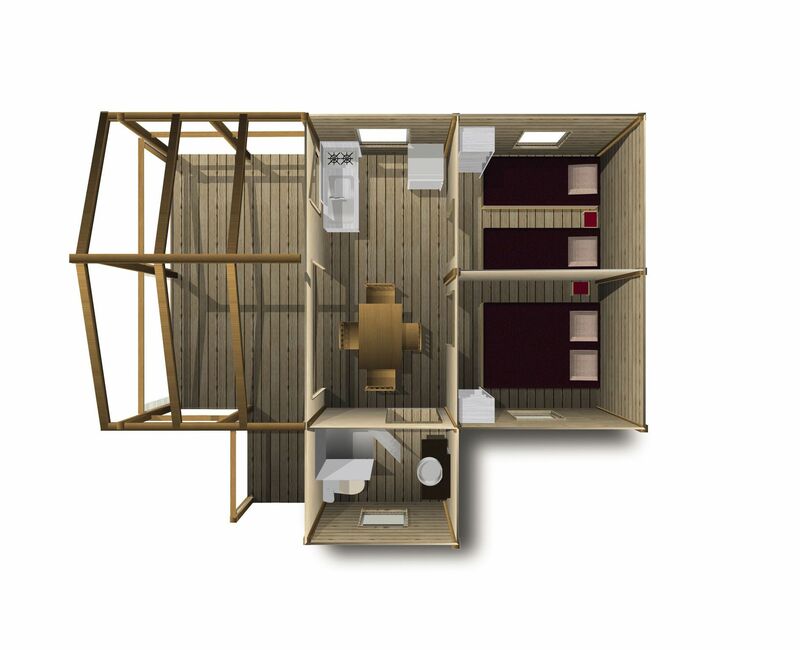 A comfortable mobile home (2016) where you can enjoy the quietness of the camping. 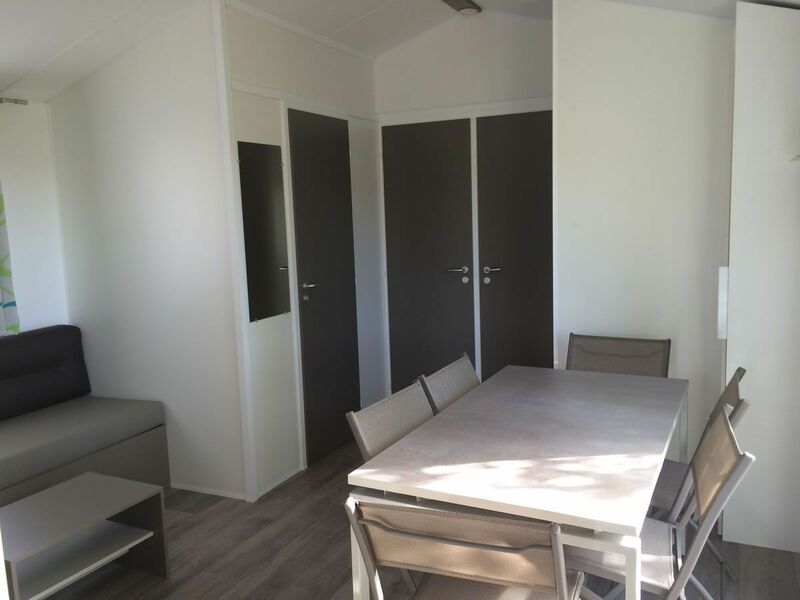 Two bedrooms with two beds each 80 cm wide with blanket. A living room / dining room. A covered terrace of 12 sq.m. with garden furniture. 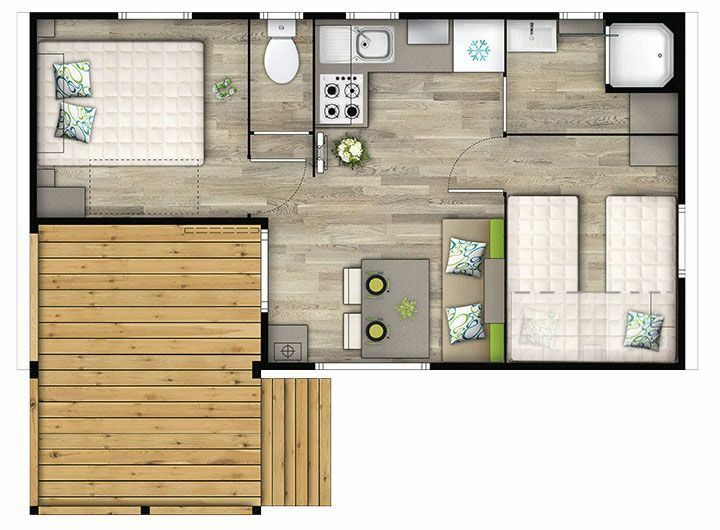 You can consult the inventory of mobilhome Bahia here. 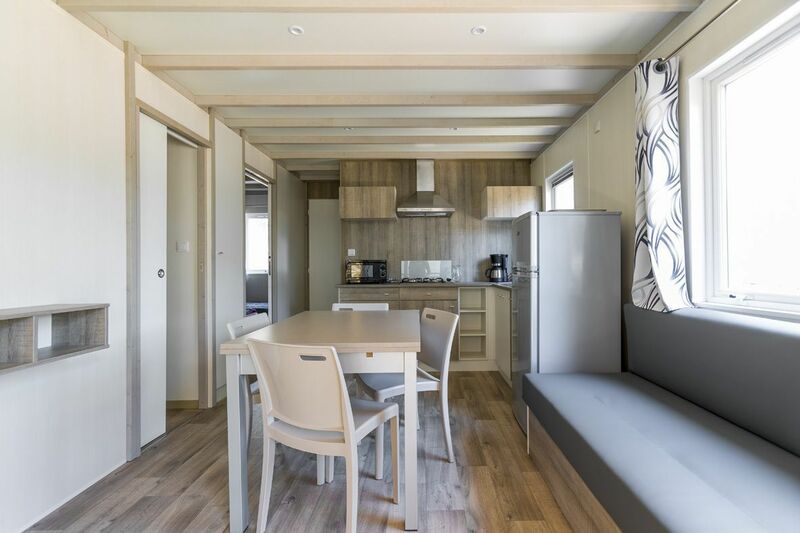 A modern mobile home (2016) where you can enjoy the quietness of the camping and the view on Mont Ventoux. 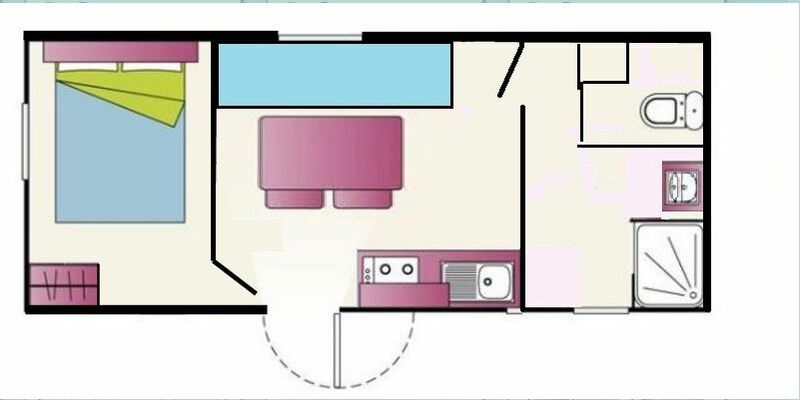 A bedroom with a bed of 140 cm with a blanket. A living / dining room with air condition. A covered terrace of 14 sq.m. with a little garden and garden furniture. 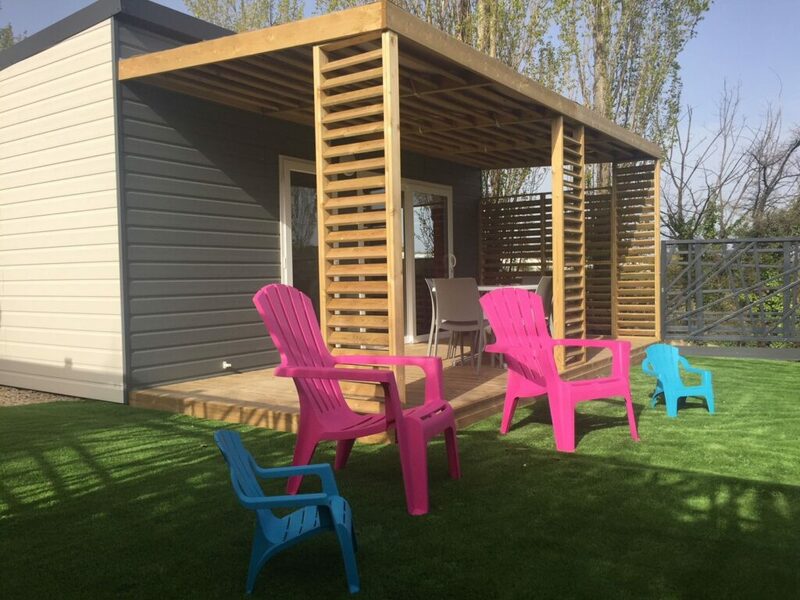 You can consult the inventory of chalet Sesame here. NEW 2018 ! 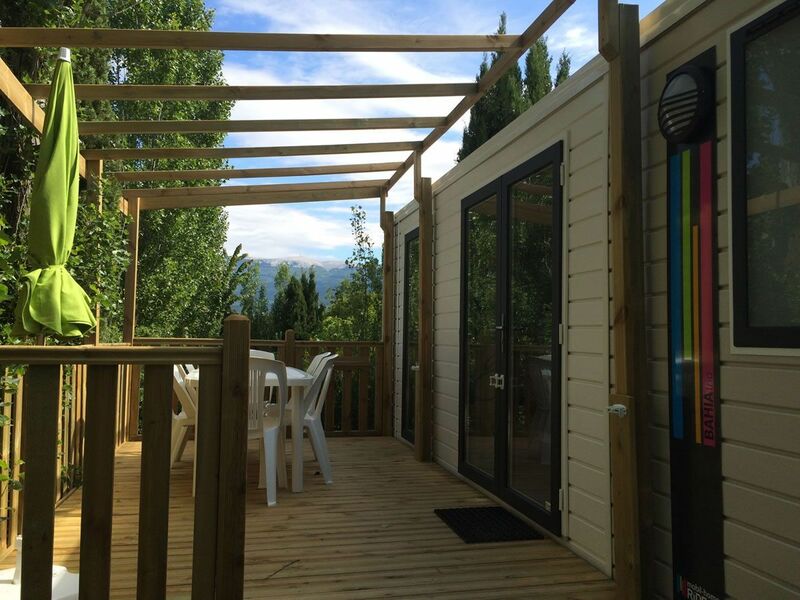 This chalet has air condition and a little garden with a great view on Mont Ventoux. A bedroom with bed 160 cm with blanket. 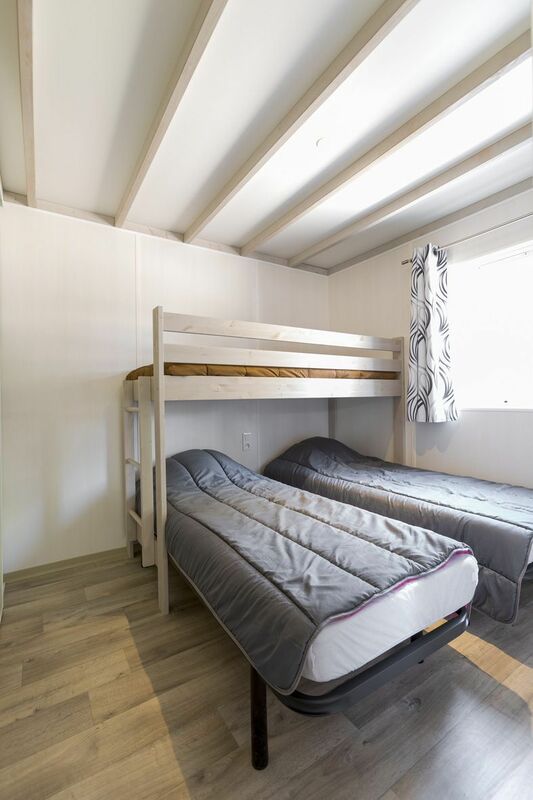 Two bedrooms with two beds of 80 cm wide each with blanket (including 1 bedroom with bunk beds). A covered terrace of 15 sq.m. 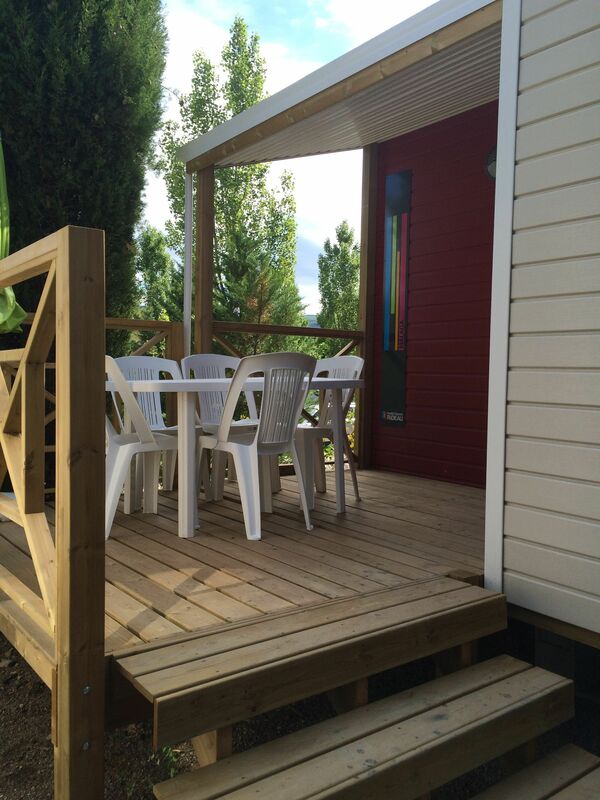 in front of the chalet with garden furniture and 2 sun baths. 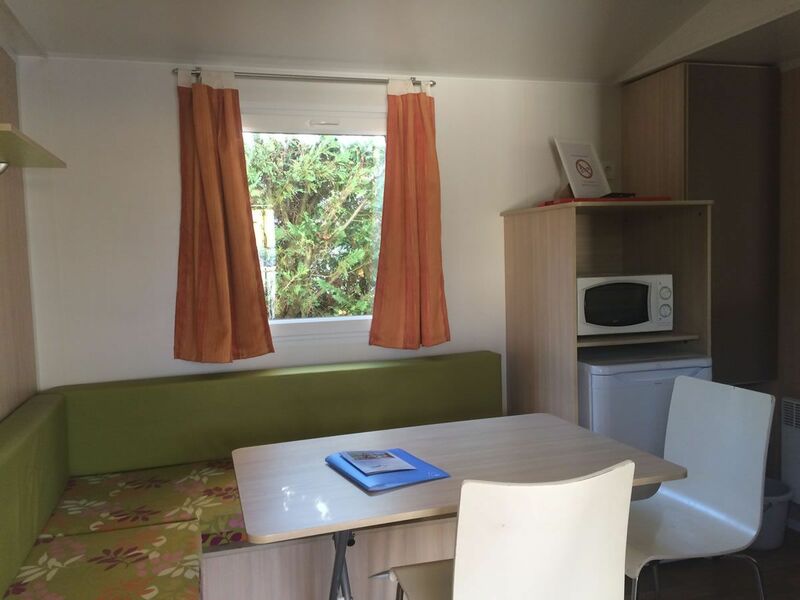 You can consult the inventory of the chalet Transylvanie here. 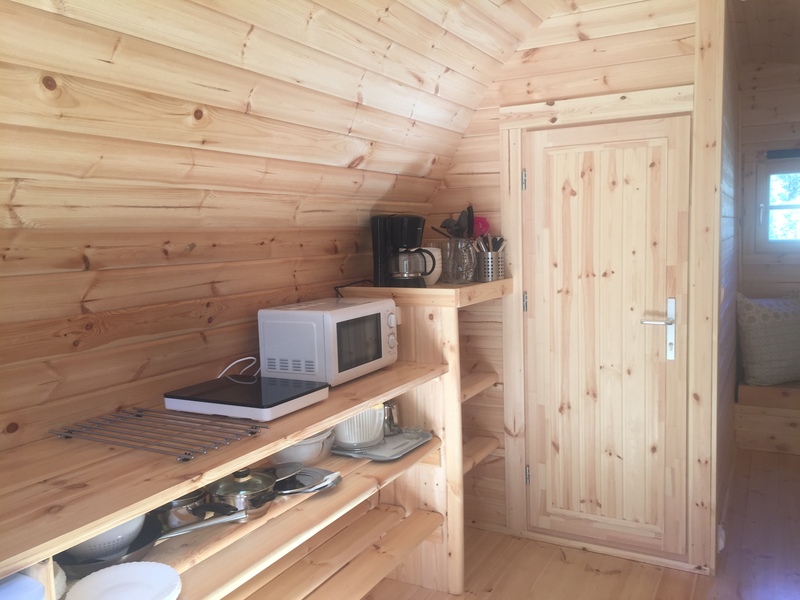 This chalet is new (2017) and is air conditioned. 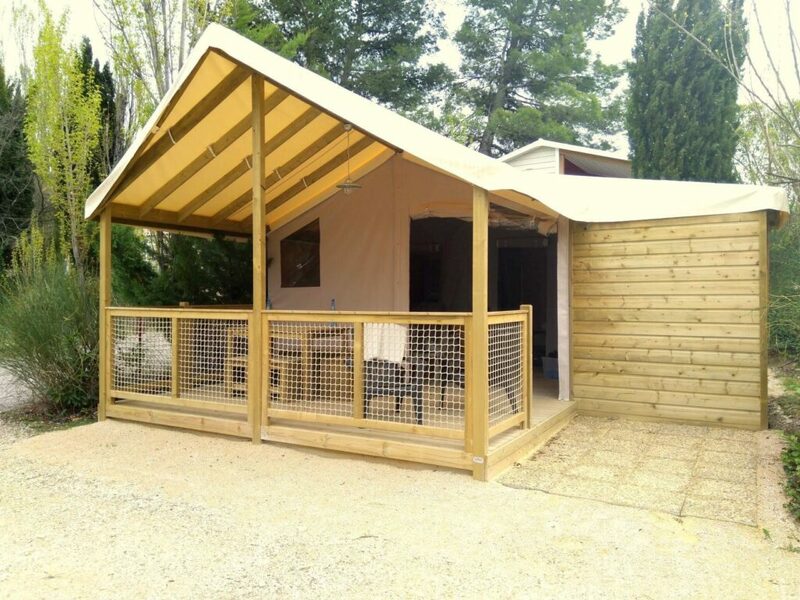 Situated at the top of the camping, it has a great view on Mont Ventoux, the vineyards and the hills of Vaucluse.